Planned Parenthood "chaplain" is a Presbyterian minister? WHAT?? This story is painful to write since this writer grew up in the Presbyterian Church, which was considered THE church to go to. It was known as the church where 'the best people' attended. That of course came about since The York Avenue Presbyterian Church in Washington, D.C., immediately became known as "The Church of Presidents" since President Abraham Lincoln faithfully attended every Sunday until he died on April 15,1865. The presidents following Lincoln worshiped in that church which is still there, at the same location where this columnist once visited. My family attended North Park Presbyterian Church in Evansville, Indiana from the time I was a toddler. It was a little brick church in walking distance from our home. I was baptized there and graduated from the Cradle Roll Bible Class (with honors of course). Yep, I wore my first cap and gown when I was three. We loved that church I grew up in. We could not imagine it with any other pastor than Rev. Addison Chapin, who had served as a missionary in Africa before becoming a pastor. With his little square mustache, he looked like a cross between Charlie Chaplin and Adolph Hitler, with a resonant deep voice that held everyone's attention. That was in the days before microphones or sound systems. It would have been unthinkable to imagine this church partnering with the world's blasphemous thinking, tossing out morals, and embracing the most disgusting sexual excursions that could be thought up, and encouraging it. The church eventually broke into two factions, Presbyterian USA which turned disgustingly liberal, and Presbyterian EPC which stands for Evangelical Presbyterian Church, the side that believes and preaches what the Bible says. So it is the Presbyterian U.S.A. who has sold out to Satan and has partnered with Planned Parenthood, a billion dollar a year killing industry that tears apart little pre-born babies, limb by limb, who are simply inconvenient for the parents. 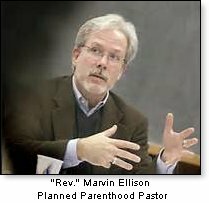 As for this 'Presbyterian minister' who has joined Planned Parenthood, it is especially distasteful to be forced, by tradition, to call this religious fraud, "The Reverend" Marvin Ellison who has turned his back on the God he pledged to serve by helping an abortion business in Portland, Maine that earns a fortune by horrifically killing little-about to be born babies. We have heard of other locations where a minister "serves" at these places. The Portland, Maine abortion factory was 'blessed in God's Name by "Rev." Marvin Ellison. This pus bag wrote a column for The Press Herald, to defend his abortion advocacy. That Portland abortion chamber aborts babies up to 18 weeks and 6 days of pregnancy, long after they already have heart beats, brain waves, fingers, toes and their own unique fingerprints. Their nervous systems also are formed and they can feel everything that touches them. They use a device that goes up into the womb, grips a little leg or arm, slice it off, then pull it out to go back in and do it with the other limbs. And these helpless babies SCREAM. Indeed, one of the butchers who was new to the job, bragged to impress the others, that she slit the throats of the babies so they could not scream. So what did she expect, for her audience to yell BRAVO? Probably. Micaiah Bilger writing for the newspaper in Augusta, Maine, said that the impostor 'minister' described Planned Parenthood's work as, now get this, "Life Affirming." Are they all mad? That gastric accumulation that calls himself "a man of God," went on to flatulate; "We're proud to be part of a highly professional and highly caring health care team," he said of himself and four other volunteer chaplains. "Along with our Planned Parenthood colleagues, we're committed to showing care and respect for the whole person, including her (or his) physical, emotional and spiritual well-being." It gets even nuttier as Ellison sputtered on that he is an abortion supporter because of his Christian faith and values. How's that again?Then that pile of food that has been eaten and dispelled from the body, then bragged about his influence on patients' religious views. Recently Ellison and other "chaplains" hosted a service to bless the Planned Parenthood abortion facility. And Ellison and the other fake chaplains will have to explain all this to God at the White Throne Judgment which they all are facing. How I would like to be there to witness this as the trap doors open. At that 'blessings service,' Ellison burped on by stating: "We believe in its mission (Planned Parenthood) and its life affirming values, As we said during the blessing, 'We Thank God for Planned Parenthood and for the amazing work you do, day in and day out, with passion, courage, wisdom and grace. "As chaplains, we recognize that planned Parenthood is called many names. Some of those names are hate-filled, disrespectful and terribly misguided. At the blessing, we concluded the event by saying, "Hear this loud and clear. In the name of all that is holy and good, Planned Parenthood your name is blessed. Each staff member is a blessing to this community and to those for whom you provide health care, education and advocacy. You are the blessing, and we thank God for you." These flattering words were flung out to embrace those who most cruelly murder little babies about to be born! This is nuts! For Marvin Ellison, that fake minister whom Satan himself ordained: Sir, it would be better for you to leave the ministry NOW, flee the ministry and stop dabbling with Holy things. You have no business handling any sacred objects. Flee the corrupt ministry you head before it is too late. And this includes any misfits who hang out with you. You are a mental case, making you and those who associate with you think that what you are doing is service to God. IT IS NOT! Read the story of Molech in The Bible. There were idols in those days, made of brass in the shape of a being. The ignorant masses bowed down to to this Idol as if he were God. He was known as 'the fire god.' Babies and little children were brought to his brass idol, placed on the outstretched hands of it where flames embraced the children who screamed loudly. They were either burned alive, as a sacrifice to please Molech or fell between the outstretched arms to a roaring fire below. And guess what? To drown out the screams of the innocent children who had done no wrong, they had drums and musicians playing to drown out the screams of the babies and children. We are doing the same things today. And we have many distractions to virtually drown out the screams of the little babies being aborted. I urge you who follow Ellison to get away from corrupt pastors like him, for the sake of your own souls. And anyone else who has a corrupt pastor like like that wretch, get out of that church immediately. There are many great Bible believing churches out there that can be found. Since the beginning of this column many years ago, I have stated over and over that the world has gone to pieces due to the failure of the pulpits. Ministers have started flirting with the world, others being spotlighted in the newspapers for the wrong reasons. Yes, sin. Careless conduct, being irresponsible, having that drink, all tear down the image we should all have. Again, we are not supposed to be like everybody else. Preachers have abdicated their leadership position in society by compromising the Word of God, watering down the sin problem, being caught in adultery, misappropriating money. 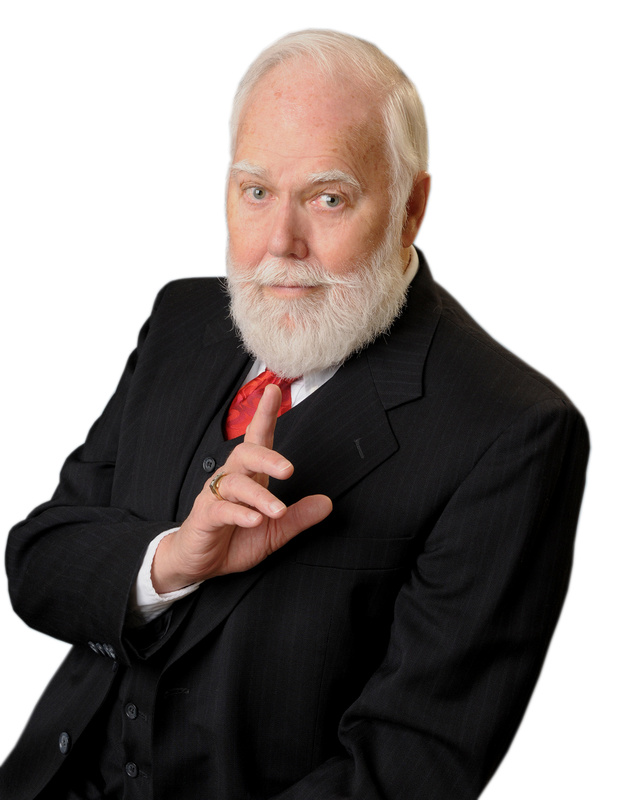 Since beginning this column years ago, I have stated over and over that the reason the world has gone so wacko is due to the failure of the pulpit. Pastors are not supposed to be 'one of the guys,' or he's just like us. We are NOT. We have been entrusted with a sacred appointment. Let us carry that out with honor. Otherwise, preachers like Ellison will pull you down through that trap door with him. LAST WORDS: Planned Parenthood is the largest abortion business in America, aborting approximately 320,000 babies every year. Now that is BABIES, not a fetus. It's most recent annual report showed a record income of $1.46 BILLLION for the 'NON-PROFIT," with about half a billion dollars coming from the taxpayers. Any Christian who takes part in this barbarity will indeed go through the trap door and straight into hell. Christians are called to protect and defend the most vulnerable members of society, and today, no one is more vulnerable than a baby in his or her mother's womb. Indeed, me must protect ALL of God's living creatures. And Pastors: MAN YOUR PULPITS! ANALYZING TODAY'S NEWS FOR TOMORROW'S HISTORY.